Was planning on getting a conure sometime next spring but I had a opportunity to get a nice 2 year old jenday and a large cage so I did. Currently on the way home, will post pics once I get her settled in. Here she is, very unhappy but home safe. What is your new little friend's name? We'll be looking forward to seeing more pictures and hearing all about her once she gets all settled into her new home. The first name that popped into my head was "Shasta". S/he is a beautiful little bird, congratulations!! Shasta isn't bad at all, I'll give it a test run today and see how it fits. I think this is going to be a bit of a challenge. 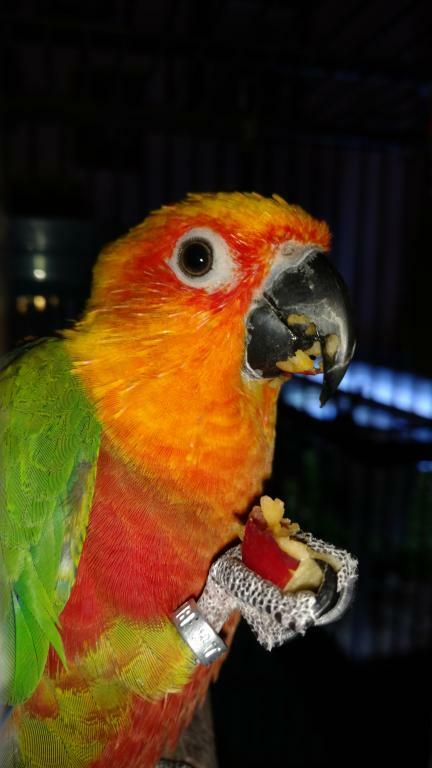 She eats fruits and veggies but no pellets and the only seed she wants is safflower and sunflower. Hopefully she won't be too stubborn about switching to a better diet. She is a bit cranky and giving very mixed signals. She begs to come out or come to me but once I have her on my hand, she starts test nibbling. If I tell her no, she bites harder until I get really stern and loud with NO! She'll act all sweet in her cage but if I get within biting distance, she will lunge. So far her bites aren't more than a hard chomp, no where near breaking skin but I need to get this stopped before it gets worse. She also wants on my shoulder which isn't going to happen until I trust her a lot more. Last thing I want is my face or neck bit. At least she knows step up and always complies even if I get a chomp in the process. This is why bigger birds scare me! Se is lovely though. I love the res around her eyes.